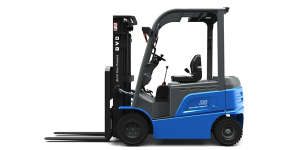 BYD has developed a driverless electric forklift together with Singapore-based ST Engineering. The two companies signed a cooperation agreement to broaden their joint activities in this field. That’s not BYD’s sole special vehicle innovation: The company also unveiled two new electric tug models. Let’s have a look at the electric forklift first: Thanks to features such as target guidance, route selection, access control identification and obstacle avoidance, the new model is said to be suitable for docks, airports, warehouses and other industrial uses. Both partners want to focus now on developing an even broader range of autonomous forklifts. Among clients who are using electric forklifts of BYD already today is Chinese online retail giant JD.com, but are also a lot of automotive industry players such as BMW, Volkswagen, General Motors, Toyota, Nissan, Renault and Kia. Besides, BYD has also introduced two new tugs as part of ground support equipment (GSE) deployed at airports: the T250 rear cabin tug and the T250F forward cabin tug. They feature BYD’s iron-phosphate battery technology, provide a towing capacity of 25 tons and are capable of both, luggage transport and towing of regional jets. The average charging time is said to take 2 hours.